Dr. 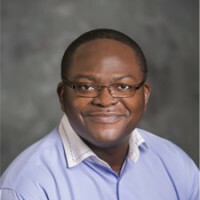 Prince N. Agbedanu joined Friends University in 2016. Dr. Agbedanu studied biochemistry at Kwame Nkrumah University of Science and Technology (KNUST) and earned a master’s degree from the Norwegian University of Science and Technology in the area of medical technology with specialization in biotechnology. He received a Ph.D. in Biomedical Sciences from Iowa State University and conducted postdoctoral research at both Iowa State and Baylor College of Medicine. He teaches Cell and Molecular Biology, Genetics and Biochemistry. He has worked and published on the screening of drug targets and currently works with students on the screening of natural/synthetic compounds that might be agents of Reactive Oxygen Species (ROS) and agents that might be potential Anti-ROS agents. Excess ROS is believed to have a role in the aging process. He engages students in this and other areas of research, including investigating the regenerative capabilities of select compounds in model organisms.